BoxingWales.com are at British Warrior’s six-fight show in association with Batch Plant. 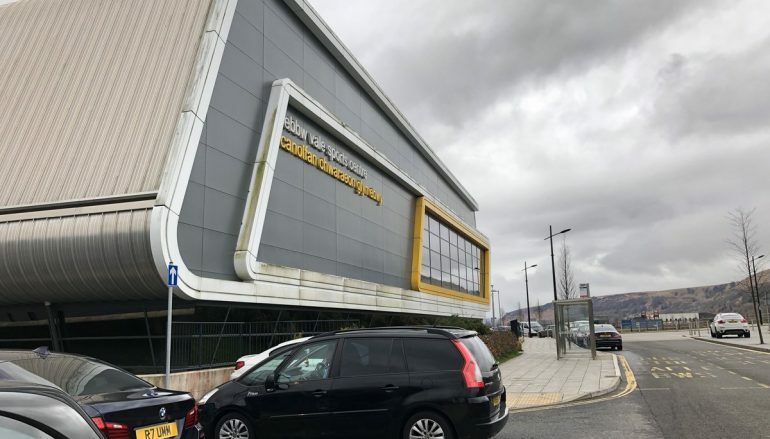 Keep the refresh button busy to find instant post-fight reports as the action unfolds at the Ebbw Vale Leisure Centre… for faster news, follow @BoxingWales on Twitter for round-by-round updates. Cardiff’s Mitchell Buckland (12-0, 2KO) overcame Portugal’s gutsy Manchester-based Yailton Neves (3-10, 1KO) by a single point, prevailing on the right side of referee Martin Williams’ 39-38 scorecard. The southpaw won two Celtic titles at lightweight and super-lightweight, though nowadays campaigns four categories higher at super-middleweight. Buckland has retained his hand speed and it helped him take advantage of Neves’ admirable ambition in the opening round. The visitor sustained a high output and although he sometimes overreached, Neves kept Buckland busy. It led to a brief breakthrough at the end of the second round as Buckland was visibly hurt. Neves, cornered by renowned trainer Oliver Harrison, launched a follow up attack but it was thwarted by Buckland, who tied the aggressor up until the bell sounded. There were a few more uncomfortable moments for Buckland in the third round but in-between Neves’ raiding attacks, the Welshman was able to pick enough straight shots to stay a step ahead. St Joseph’s Boxing Club’s Tony Borg was vocal throughout and his encouragement made it’s impact as he encouraged Buckland to up his activity as the bout closed, which proved vital when the scores were added up. Cardiff’s David White Jnr (1-0) made a sharp start to his professional career with a composed points win over Kent’s Ricky Leach (3-28-1), collecting a clean 40-36 triumph. The featherweight feinted his way forward in the first two rounds, prompting Leach to back-pedal to try and stay away from White’s fast flurries. White found success when Leach circled too close to the ropes and his corner, headed by Richie Garner, appeared happy. Leach ventured forward in the third round, squeezing up his defence and attempting to walk the debutant down. It forced White to engage more often than earlier and he was up for the challenge, landing right hooks around Leach’s defence at the start of the round and gradually edge forward again as it progressed. The final session of the four rounder played out in a similar fashion to the delight of David White Snr, the father of the winner and a former Welsh senior amateur champion himself. Barry’s Maredudd Thomas (2-0) prevailed in a quality contest against Darlington’s fellow unbeaten super-lightweight Ellis Corrie (2-1), earning a competitive 39-38 decision win. It was a refreshing meeting of unbeaten prospects – the sort of match many managers are unwilling to make after 10 wins, let alone one and two wins, respectively. 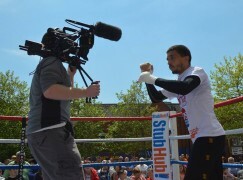 Gary Lockett-trained Thomas made a mark in the opening round, briefly buzzing Corrie with a left hook and quickly following it up with a reverse one-two. Afterwards, the pair settled down and both opted for a more patient approach. Corrie found his own success at the start of the second round, landing an eye-catching body shot. Thomas attempted to increase the space in the following moments, throwing single jabs to find his range as Corrie closed the distance. As often as Corrie enjoyed the action up close, Thomas’ straight shots were working with equal success at range and it was a pattern that continued in to the third round. There were more tense moments in the fourth and final session as neither wanted to give anything away. Thomas’ jab found gaps in Corrie’s defence on a few occasions and the cleaner shot selection was just enough to separate the pair. Newport’s Lee Churcher (13-5-1, 4KO) hoped to bounce back to winning ways against Spain’s Plymouth-based Christian Hoskin Gomez (7-32-4, 2KO) but it wasn’t to be as he succumb to a fourth round stoppage loss. After a scrappy opener, referee Martin Williams warned Churcher for holding in the second session and lost patience soon after, docking a point from the former Welsh champion. It was an uphill task from that point on and Gomez’ energy was too much for Churcher to contain. It went from bad to worse for the former Army man in the third round. After Churcher sucked up repeated waves of attack, he appeared drained and fell to the canvas, only be saved by the bell. The break wasn’t long enough and two further trips to the floor prompted the officials to wave the contest off in the closing moments. Despite suffering defeat in December, 37-year-old Churcher, who is now under the guidance of former world champion Gavin Rees, won plaudits for the manner of his performance against Joe Mullender. However, this defeat will be harder to comeback from. Rhoose’s Lance Cooksey (5-0) collected a clear 40-36 points win against Mohammed Masoud (0-1) in their energetic four rounder. The compact lightweight closed the distance from the opening bell and it led to exciting exchanges. The pair punched at the same time, meaning both had their own moments to enjoy. However, Cooksey’s made more of a dent and it was enough to secure his position on the front foot. The action unfolded in a similarly entertaining fashion in the second round and though Cooksey made the greater impact again, what he received in return was enough to inflict a cut over his left eye. The bleeding was controlled by Bill Reynolds in the corner. Masoud was difficult to read and Cooksey, encouraged onwards by Tony Borg, had to persist to produce clean work. The Welshman’s second phase was more effective than his first, often because Masoud would lose his shape and afford Cooksey the opportunity to pounce. By the closing round, Cooksey was clearly the better man and his energy was rewarded with the right result. The former international level amateur has served his apprenticeship as a professional and he’s more than worthy of progressing to tougher opponents. Blackwood’s Kody Davies (3-0, 1KO) cruised to a comfortable distance victory against Derby’s durable Elvis Dube (7-61-2, 5KO), scoring a first round knockdown on his way to a 40-35 decision win. It was a quick start for Davies, who pivoted around Dube and dropped the off-balance visitor with a right hook to the body. Dube rose unhurt, took a deep breath and composed himself before quickly retreating from Davies’ next attack. Davies, trained by former world champion Gavin Rees, didn’t smell blood and get carried away by going for gold. Instead, the southpaw pinged a series of jabs to his shorter opponent to make full use of his height advantage and settle in to the contest. The second round saw Davies step in with his left hand on more occasions, sinking them deep in to Dube’s stomach. Dube attempted to smother the shots and protect himself behind a high guard, only for Davies to find the gaps whenever Dube pushed out a hesitant jab. Davies altered his approach in the third round, conceding group to temp Dube forward. The tactic worked well enough to spin Dube head first in to the corner post, though a more open target was difficult to locate. Dube remained evasive in the final round and never offered an output for Davies to worry about, fulfilling his role as one of Britain’s most dependable journeymen. 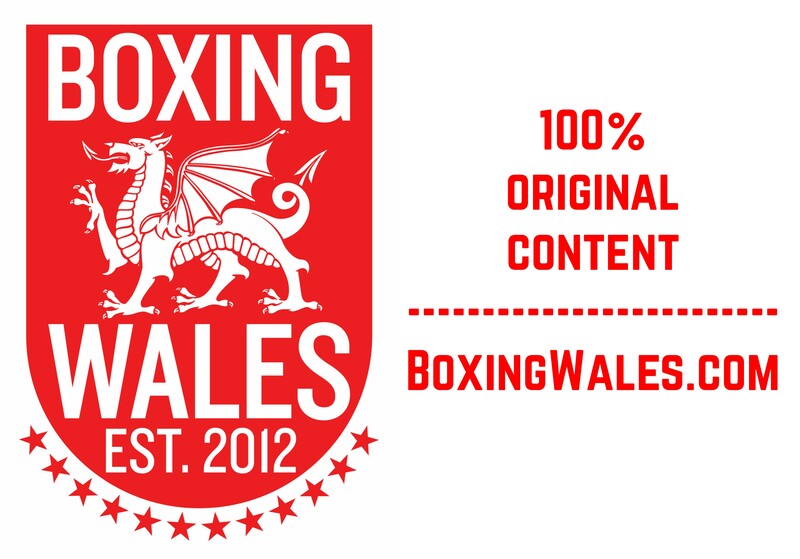 Having now signed with Hayemaker Ringstar, the promotional venture of former world heavyweight champion David Haye, this may have been the last opportunity Welsh fight fans have had to see Davies on home soil for a while.